Four Cheese Paratha is something that I made when I was short of vegetables and there was no meat at home. I wanted to make something tasty and crispy. Something that could go with my green garlic chutney and yoghurt that I had in the fridge. I wasn’t sure at first as to how the combination of four different types of cheese in an Indian dish would work. But it turned so good that we ended up overeating. 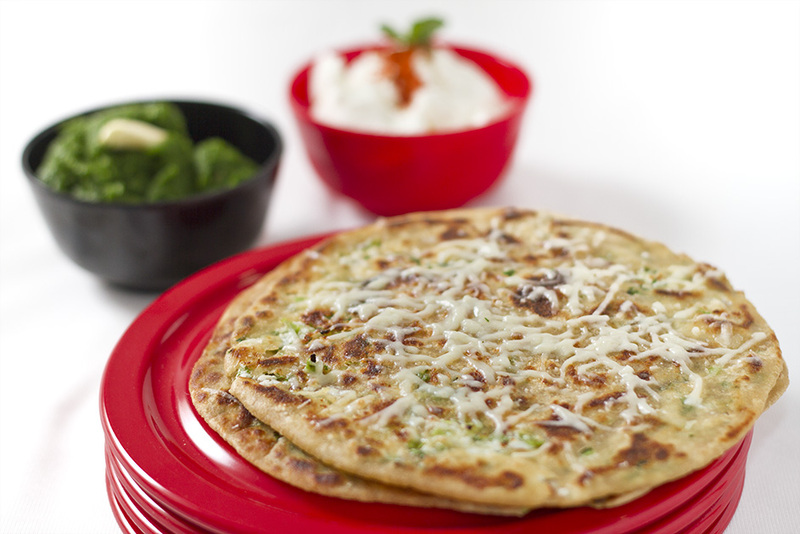 Stuffed Paratha’s are nothing new to Indian Kitchen. Indian women have always been very creative in making these so I am sure I am not the first one to try it, but I was happy with my experiment nevertheless. The cheese I chose for my Four Cheese Paratha were Paneer (Indian Cottage Cheese), Cheddar Cheese, Amul’s Mozzarella and Kraft’s Parmesan and combined them with fresh garlic greens from my kitchen garden. Oil /Ghee or butter for frying. Add some salt (about 1/2 Tsp) to the Wheat flour and knead it into a smooth dough. Combine Cheddar Cheese, Paneer, Parmesan and half of Mozzarella and mix it with garlic heads and greens. Keep this mix in the fridge if you are not immideately making the parathas. Add salt to taste just before making parathas. This is your Cheese Stuffing for the parathas. Now pinch a small ball from the dough, pat it with flour and roll into a small circle using a rolling pin or hand. Take about a Tbsp of Stuffing and put it in the center and seal the ends to make a nice round ball of dough with Cheese stuffing inside. Pat it down on your palm a bit. Roll the stuffed dough ball carefully so as not to spill the cheese out. A bit of cheese stuffing will come up but that's ok. Carefully lift the rolled paratha and put it on a hot and oiled flat frying pan. Cook both the sides of paratha adding drops of oil all around and over it. Just before taking the paratha out of the pan, sprinkle a bit of Mozzarella on one side of the paratha and cover the pan for 30 seconds. The cheese will melt and become stringy. This is when you take it out of the pan and serve hot with Green Garlic Chutney and Curd. Cheese is valued for its portability, long life, and high content of fat, protein, calcium, and phosphorus. Cheese is more compact and has a longer shelf life than milk, although how long a cheese will keep may depend on the type of cheese; labels on packets of cheese often claim that a cheese should be consumed within three to five days of opening. Generally speaking, hard cheeses last longer than soft cheeses, such as Brie or goat’s milk cheese. Cheesemakers near a dairy region may benefit from fresher, lower-priced milk, and lower shipping costs. The long storage life of some cheese, especially if it is encased in a protective rind, allows selling when markets are favorable.